I have found a chocolate cake that I love. 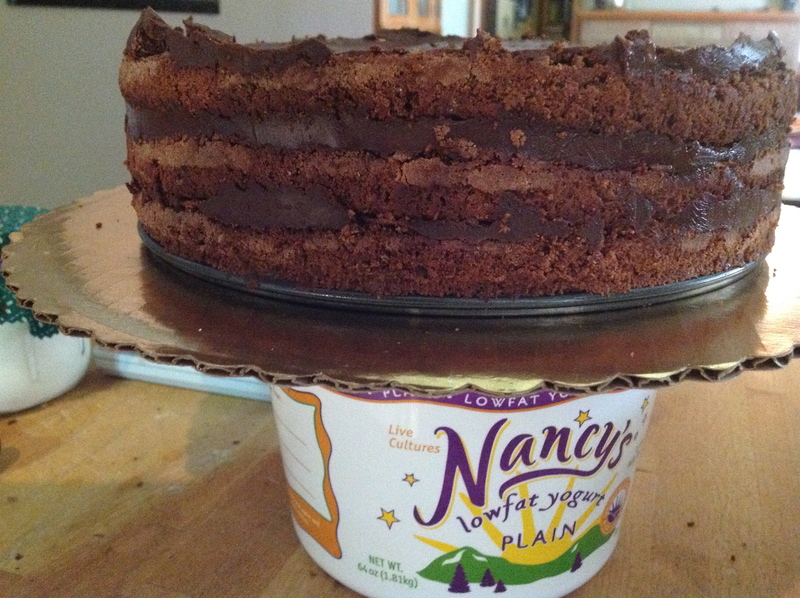 I have a simpler chocolate cake, an any day, make-on-a-whim chocolate cake that is really good, but this new one? It is very good. I found the recipe a few years ago on The Faux Martha, made the cake as written, in collaboration with my baker niece, Annie, for Spouse’s birthday. 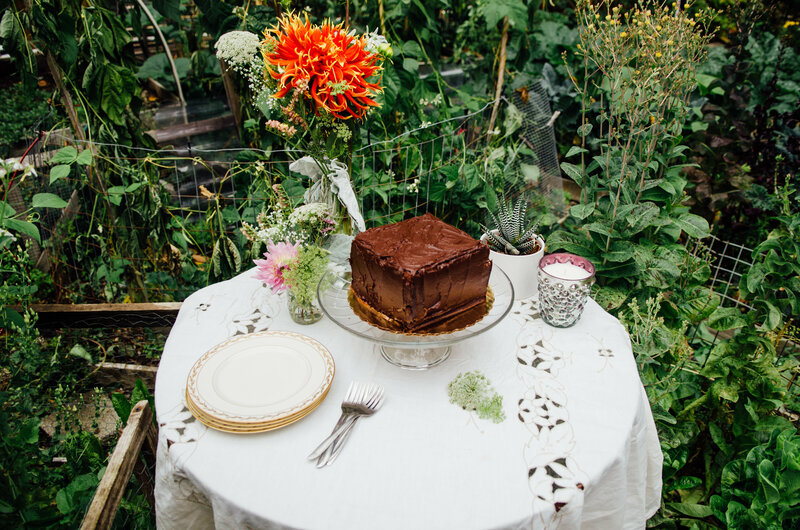 I collaborated with Ann because this cake uses an Italian Buttercream, a Salted Caramel Italian Buttercream. 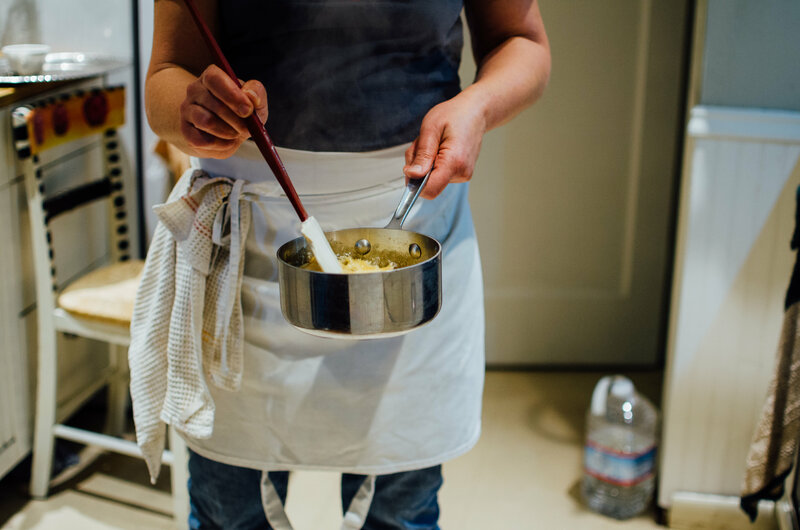 Planning a dinner party for 20 allowed me few extra neurons to devote to something I had never made before, something that sounded so-daunting. 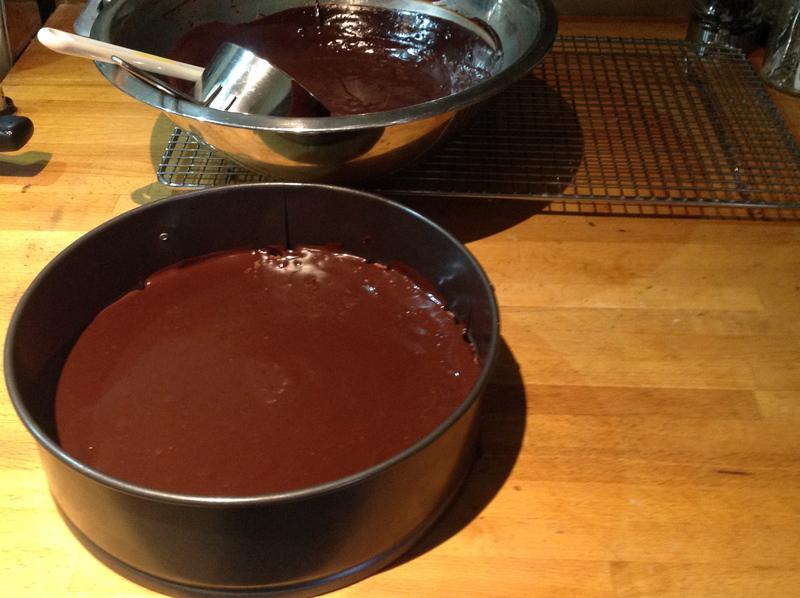 Annie, a caramel pro, produced a beautiful product with which we filled the cake before finishing with ganache. 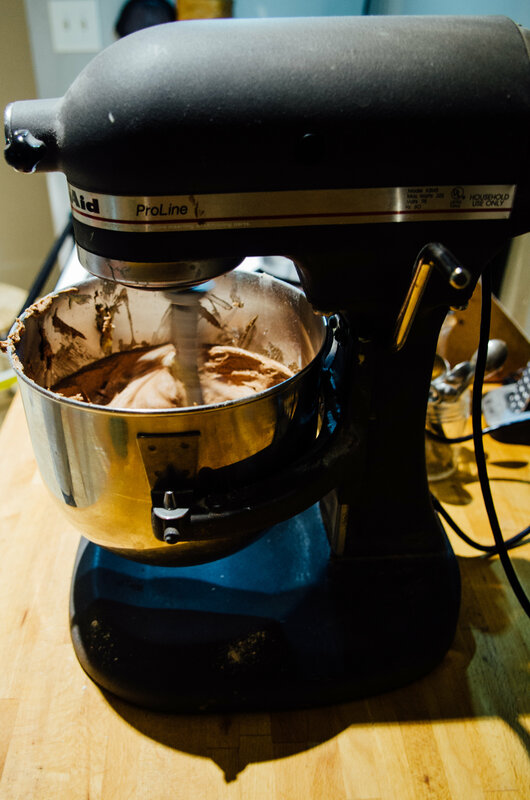 Despite the rave reviews and Annie’s reassurances to the contrary, that intimidating buttercream left the recipe to sit unceremoniously disheveled, piled in with all the Others on the shelf directly behind my office chair. A few months ago, for reasons I can’t fully remember, the cake returned to my consciousness. Planning a baby shower for a dessert-loving co-worker, I knew I had to make this cake. 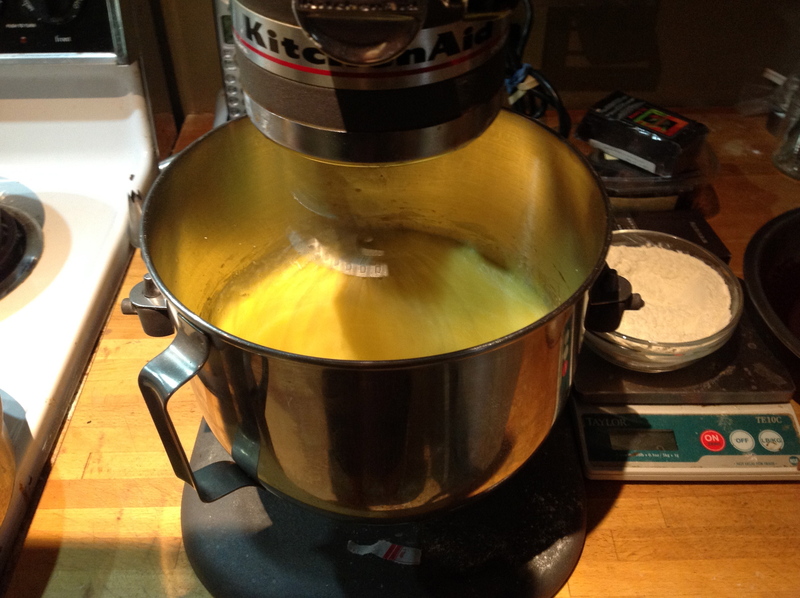 This time I reduced the sugar a bit and used fresh-ground, whole grain einkorn flour. 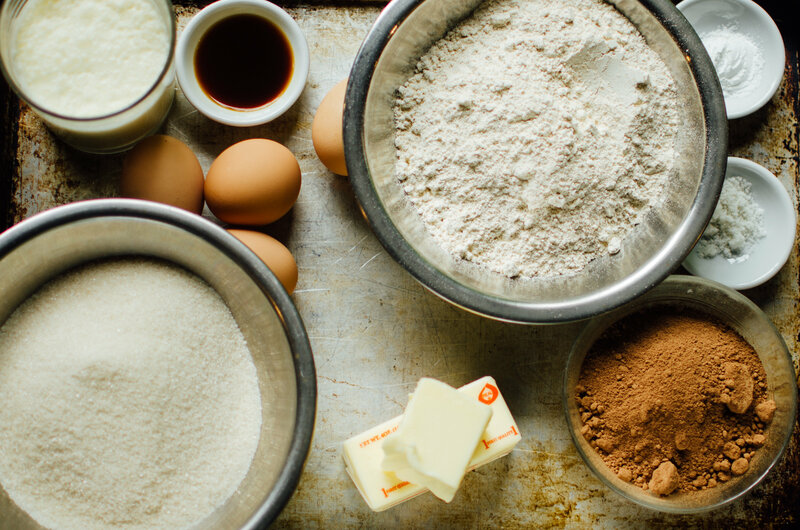 Einkorn, with its naturally lower gluten levels, produces an excellent pastry flour. Though any finished product might be a tad more dense, not sifting away the ground germ & bran keeps the protein levels high. Low gluten, high protein. Einkorn is crazy. I made a few iterations then my niece Betsey came over with her camera for Cake Day. Here’s what went down. 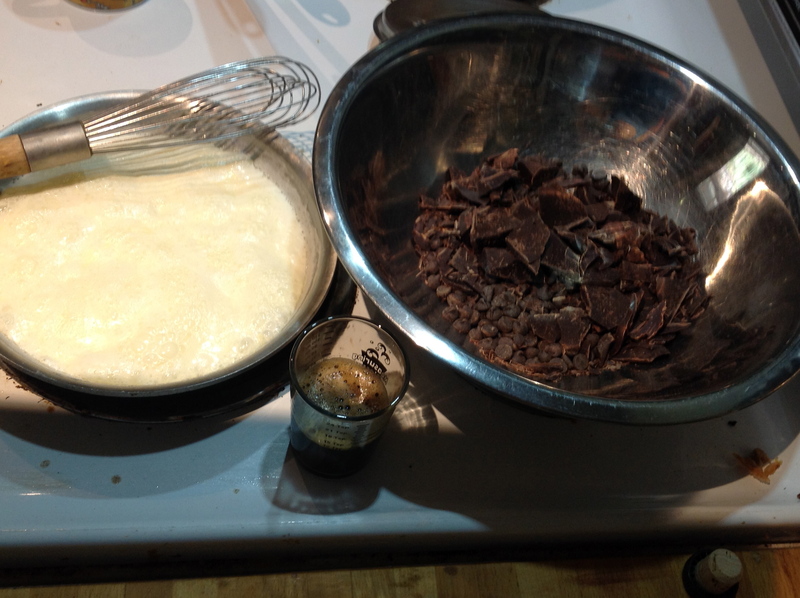 A basic butter cake using natural cocoa powder, but with half & half rather than just milk. 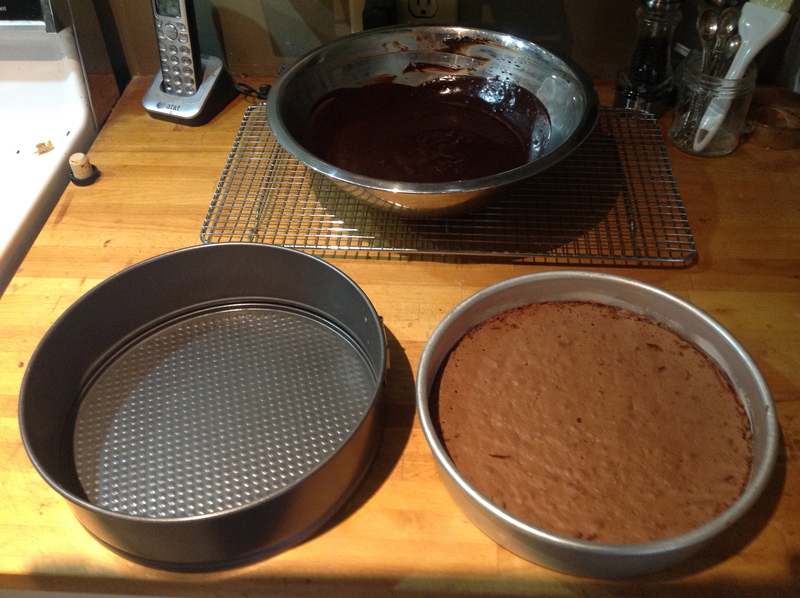 I wanted a 6-inch by 6-inch square finished cake, so used a 12-inch square for baking. 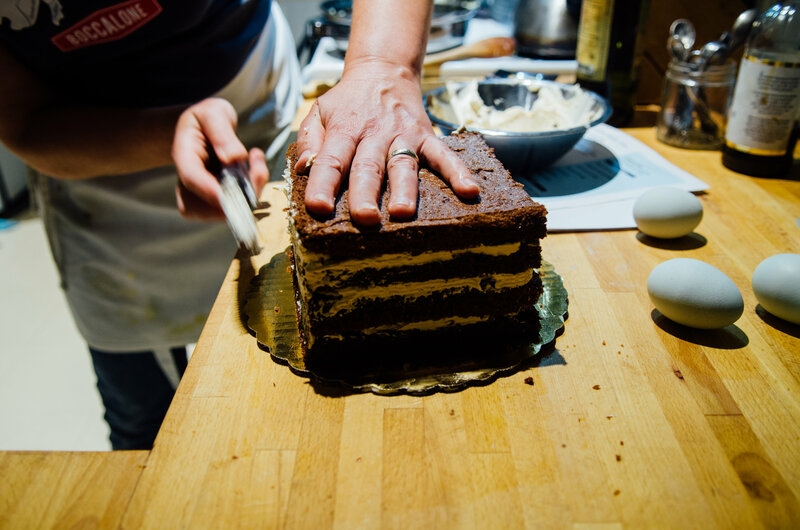 One recipe yielded four 3/4-inch layers. 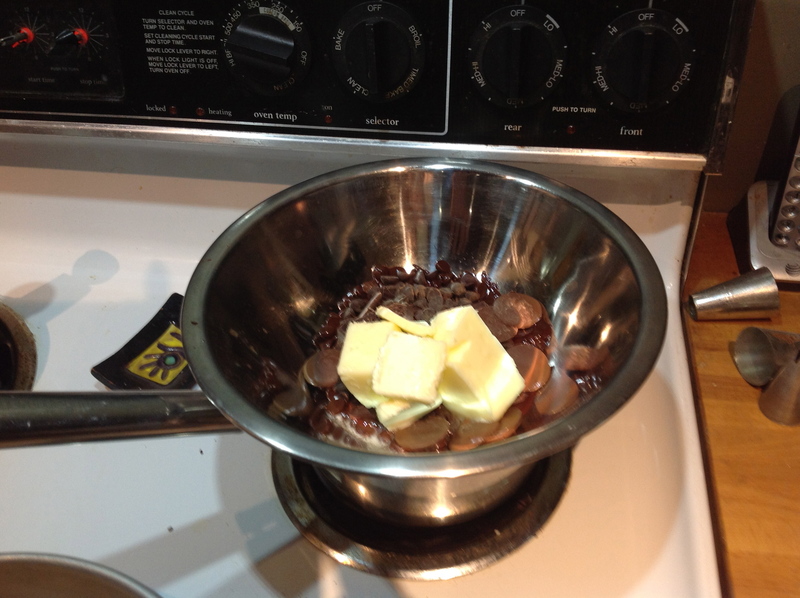 I reduced baking time, watching the oven closely, to account for the increased surface area. 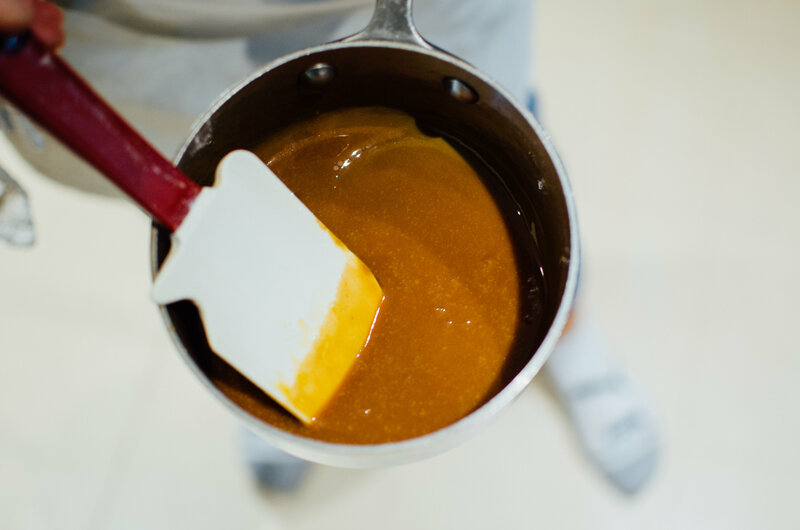 The buttercream will have its own post, but while the cake baked, I made the caramel, ensuring time for some cooling before adding it to the whipped butter. I did find that if the caramel had cooled a bit too much, the buttercream became Toffee Buttercream, also delicious. 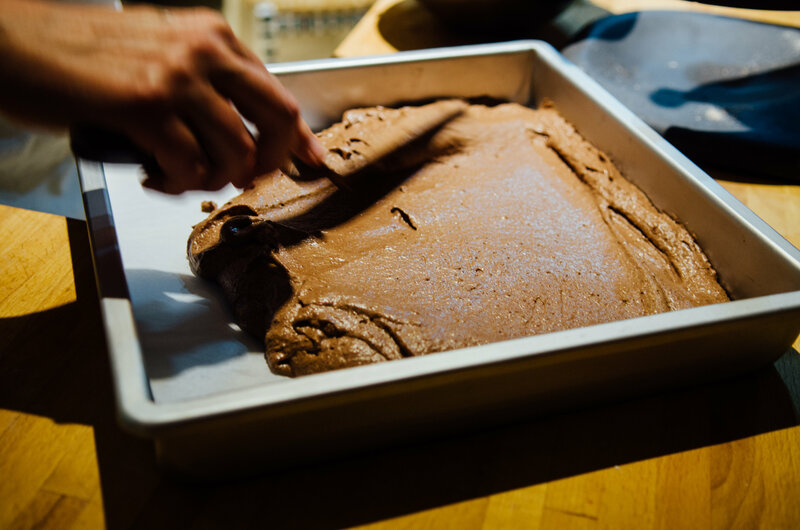 The ganache frosting is enriched with egg yolk and a small amount of butter, cooled, then whipped for a matter of seconds to incorporate a bit of air. 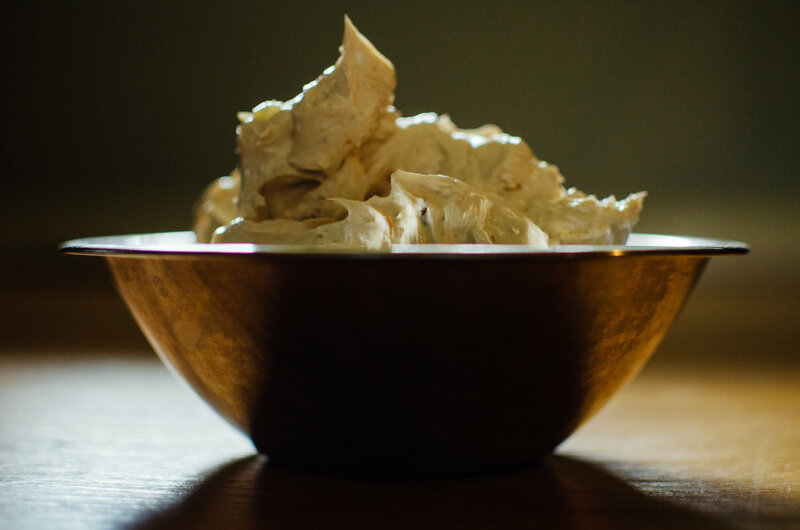 If it goes grainy, you can rewarm, recool, rewhip. 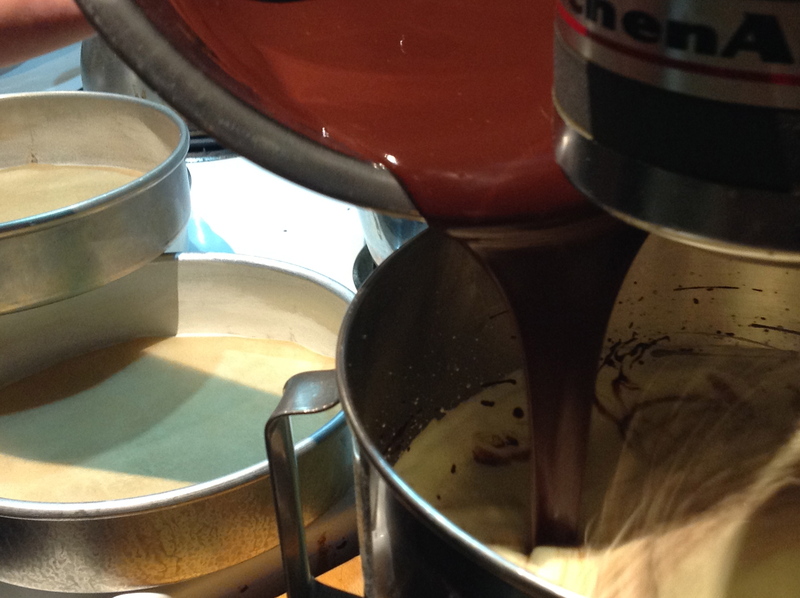 Finally, the layers were filled with buttercream, each pressing into the last. I chilled the cake, then finished with the ganache frosting. 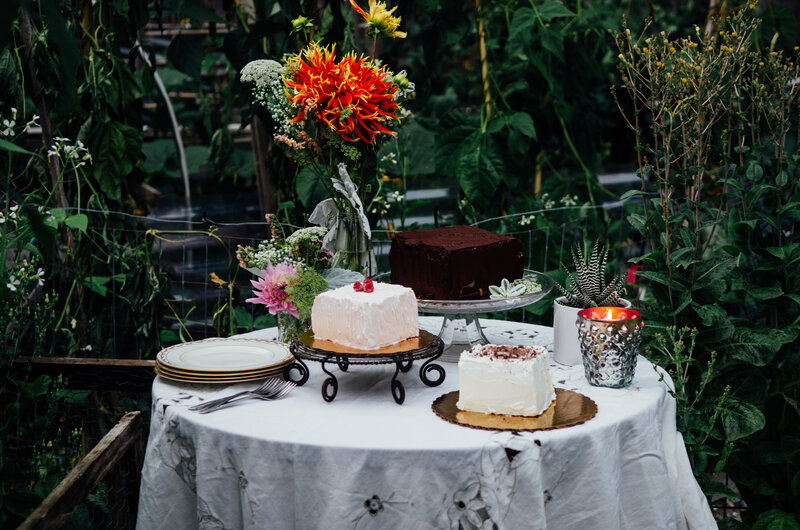 Since Betsey is a photographer and nothing beats natural light, she set a charming garden scene for the finished photos. We didn’t cut this cake open. It was to be eaten the next day for a Nephew-FatherInLaw Combo Birthday. This, along with the other two cakes I made. It was, after all, Cake Day. I’ll leave you to use the recipe linked at The Faux Martha. 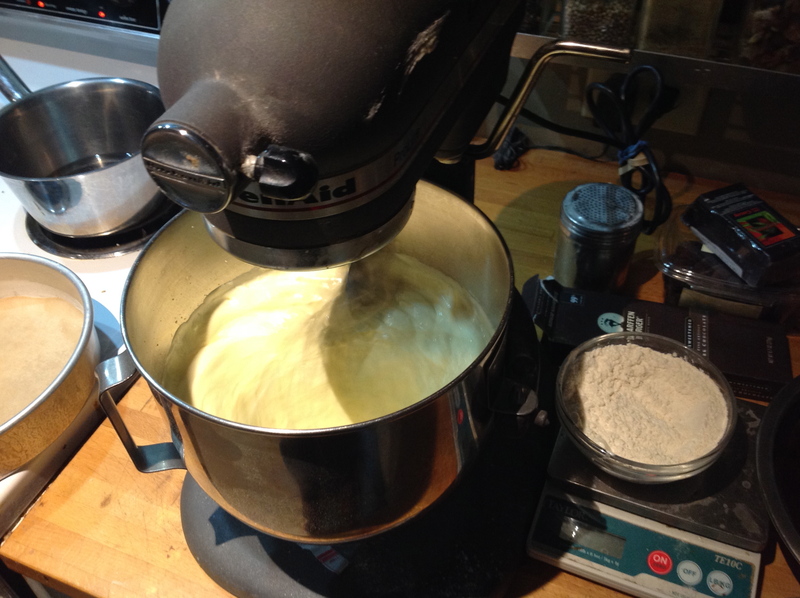 If you want to try Einkorn flour, I used it ounce for ounce as the recipe is written. Enjoy! With the first assignment being scones I had baked for years, starting Tuesdays With Dorie in March was easy. So easy, it felt like cheating. 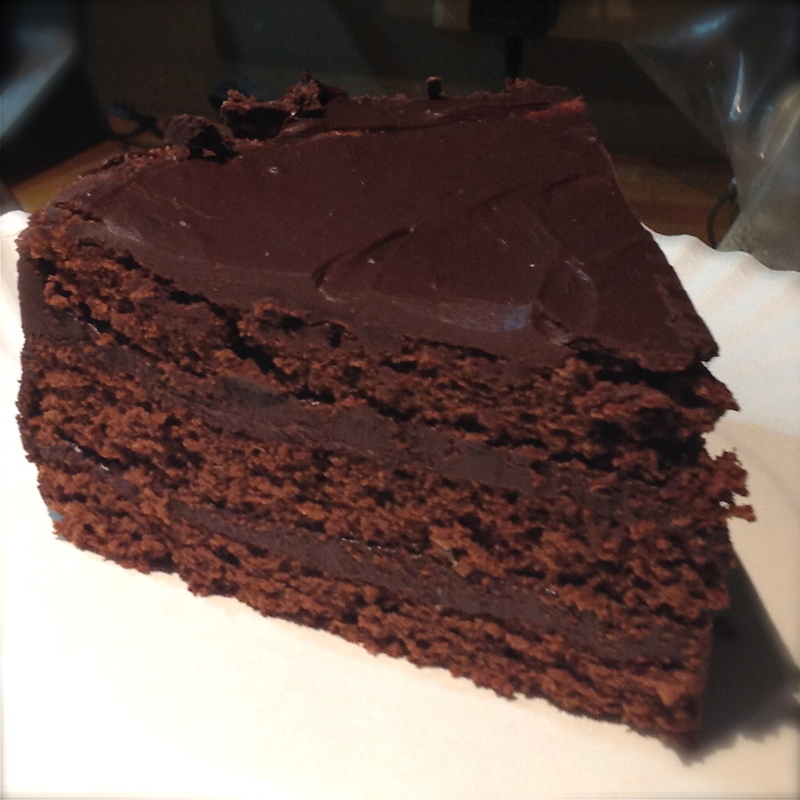 March’s second assignment was Mocha Brownie Cake. The cake looked delicious, but I was emerging from 3 weeks of cake research and testing for Wednesdays, and, subsequently, Junior’s birthday. I had to admit that I was actually sick of cake and would NOT be doing a second TWD blog post for March. I *gasp* didn’t want to think about cake! The Fates showed mercy, though, (I’m not sure The Fates do mercy, being fate and all) and gave April three Tuesdays in which I could work with Dorie. The occasional third Tuesday in any given month is a Rewind week: one can revisit a previous favorite or pick up a recipe that had otherwise been skipped. 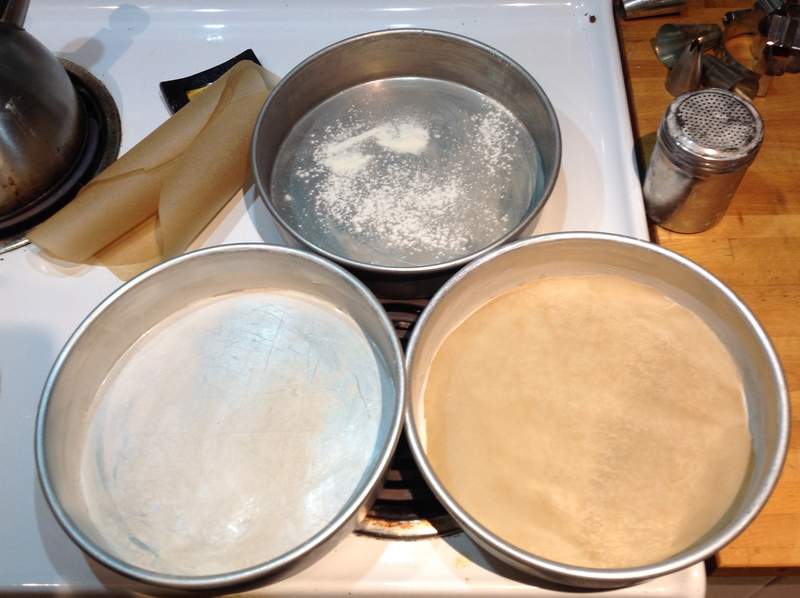 This wildcard week would give me two entries for the month, since I had no intention of doing April’s 2nd project: lefse. I grew up in a Lefse Household, and while I appreciate it for the heritage tag, and while I could have borrowed the electric skillet gizmo to bake them on, the cloth-lined rolling-pin to roll them with, as well as the special stick to flip them from my Mom, I don’t like lefse enough to have squeezed the project into my early-April life. Needing the TWD projects to remotely fit into my IRL existence, I decided the Mocha Brownie Cake would be perfect for the Spring (aka Birthday) Dinner I make yearly for my lovely Mother-in-law. This cake did not disappoint. 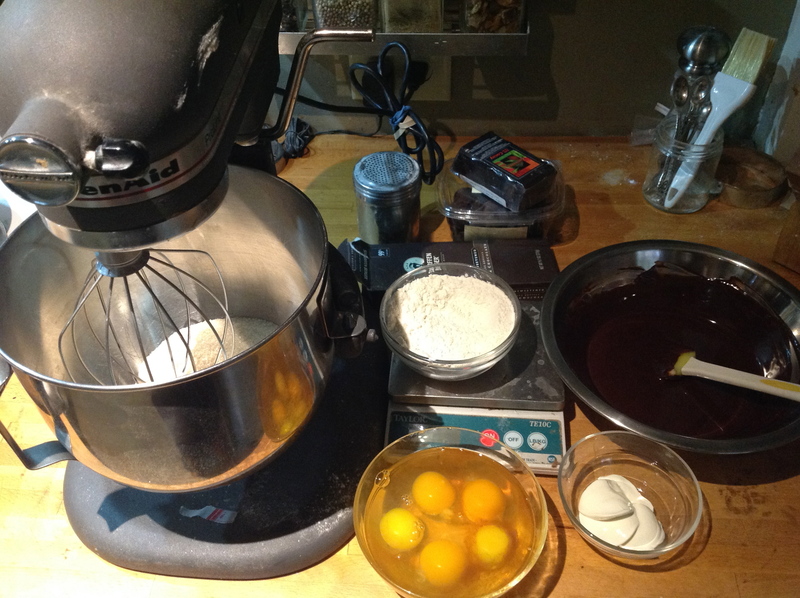 The recipe calls for 5 eggs which should be beaten until a bit thickened and doubled in volume. This step highlights one of my favorite metamorphoses of the humble egg. 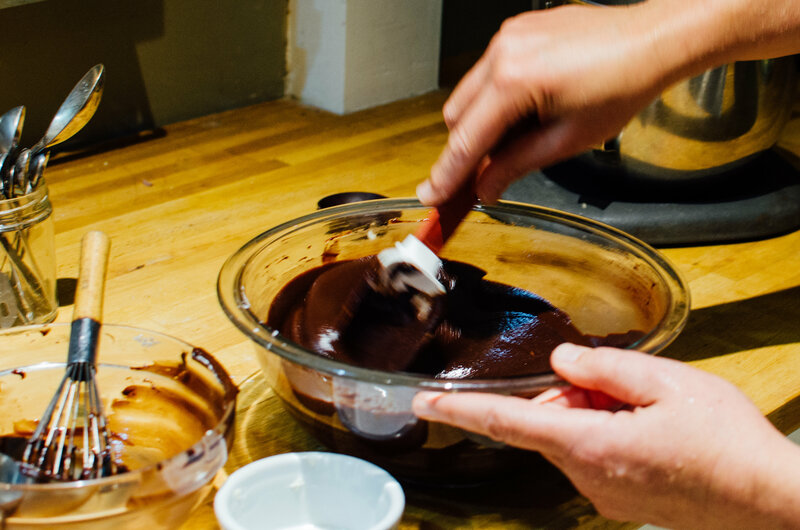 As always, the better the chocolate you start with, the better chocolate tasting the whateveritis you’re making will be. 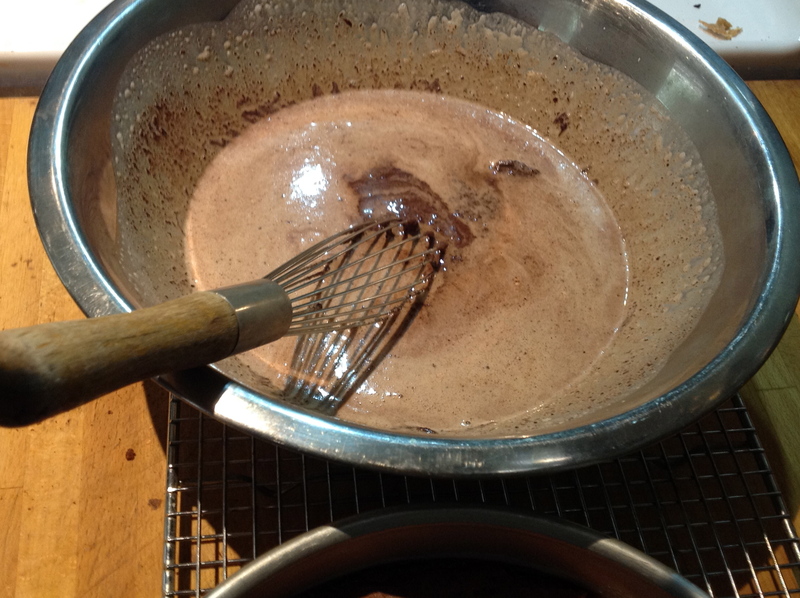 The recipe instructs to use 4.5 oz semisweet plus 2.5 oz unsweetened chocolate; I used something closer to 50/50 Scharffen Berger unsweetened and Cordillera Milk Chocolate. Intense! The mocha element for this cake comes from strong coffee (I used a shot of espresso) added to the chocolate and cream of the ganache. The chocolate I had on hand was almost equal parts: 70% Cordillera Dark Chocolate and 65% Sunspire Bittersweet Chocolate Chips. 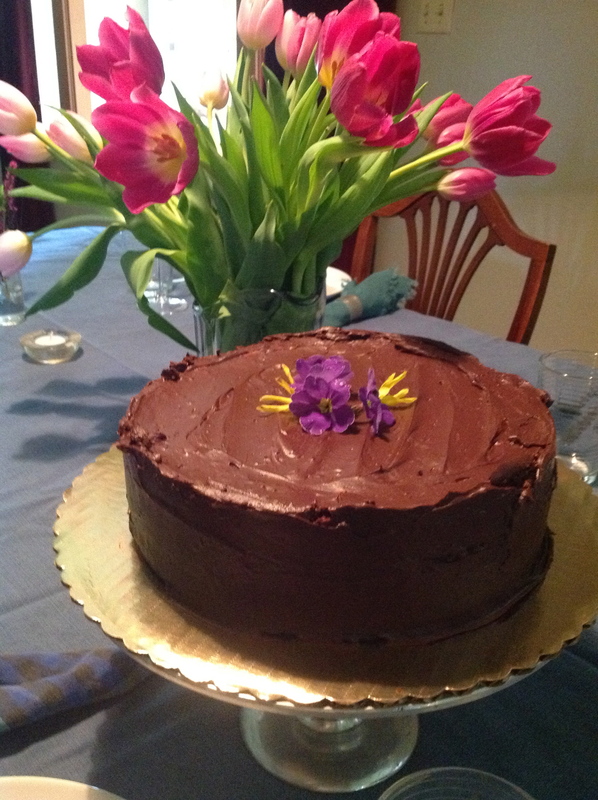 Do final coat of ganache over top & sides, then celebrate spring! 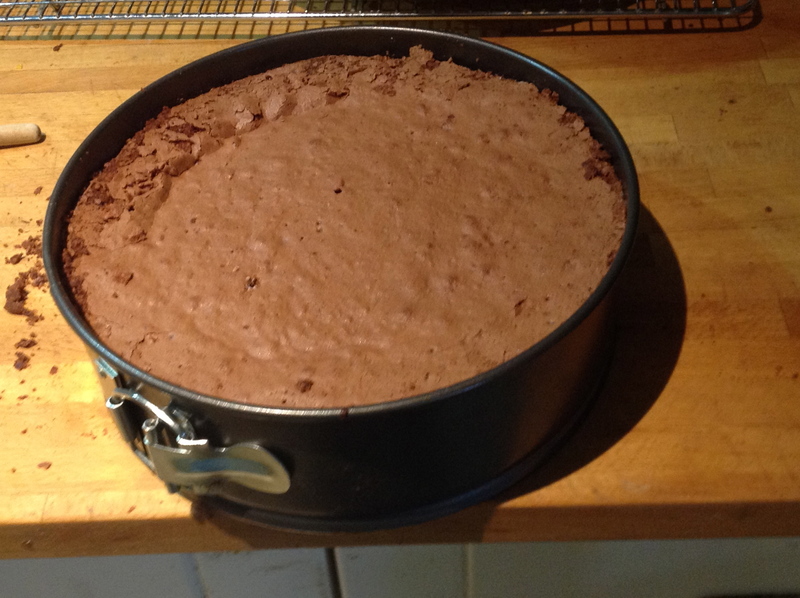 The cake was a little dry from guessing on the baking time for 3 thin layers rather than 1 thick layer. Next time, I would bake for 18 minutes rather than 20. 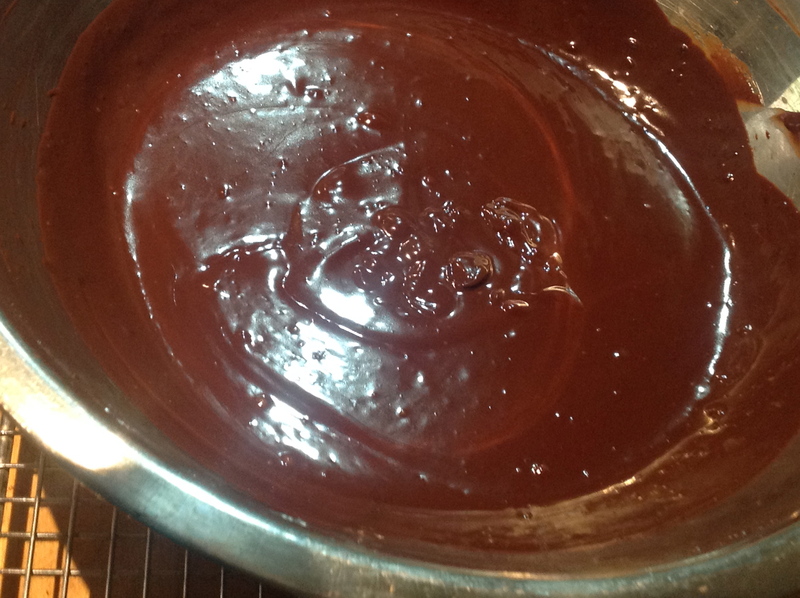 While I followed the recipe closely, measuring each cup of ganache for the filling, I barely had enough left for the final coat, so had to spread a thin layer rather than pour a smooth one. 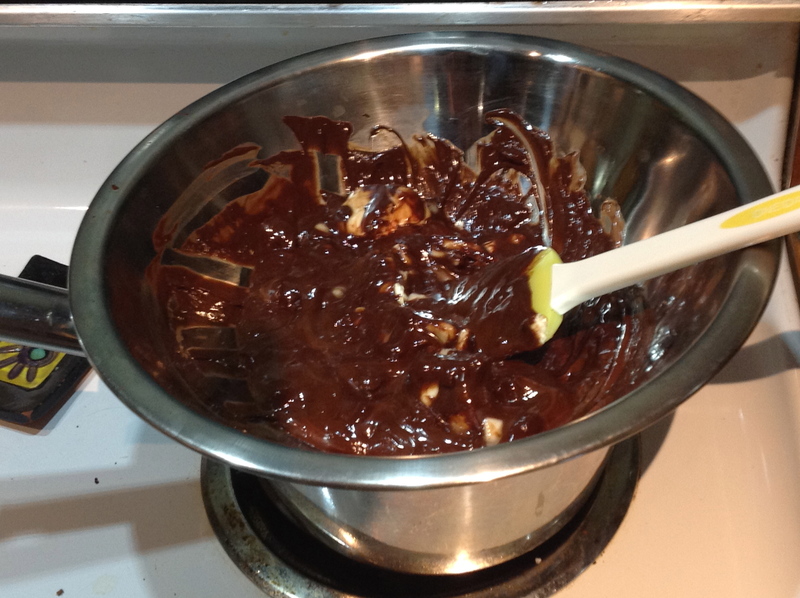 Next time I will increase the ganache quantity. That being said, this cake was delicious! It was not overly mocha-y, while being a very sincere hit of chocolate. Most important, the guest of honor found it beautiful and delicious. I look forward to making this cake for many Springs to come!